How much does it cost to travel to Heilongjiang? How much money will you need in Heilongjiang? ¥299 ($45) is the average daily price for traveling in Heilongjiang. The average price of food for one day is ¥72 ($11). The average price of a hotel for a couple is ¥239 ($36). Additional pricing is in the table below. These average travel prices have been collected from other travelers to help you plan your own travel budget. The Heilongjiang Province is the furthest northeast province in China, bordering Russia. The Province is best known for their long, cold, snowy winters, making them a popular destination for winter sports and ice festivals. Due to the proximity to Russia, Heilongjiang has a lot of Russian influenced buildings and practices; don't be surprised to see some signs written in both Mandarin and Russian in the border towns! Heilongjiang is famous for their winters, which bring about temperatures reaching just 10° Fahrenheit and bringing plenty of snow. Summers are pleasant here, with temperatures in the mid-70's, offering a great escape from scalding southern China summers. Heilongjiang is a fairly large province with a long history, meaning there is a lot to see throughout the area. One of the best places to begin exploring is in the city of Harbin, where you'll find the Temple of Heavenly Bliss. This is a lovely large temple in the eastern part of the city and it actually acts as an active and vibrant Buddhist temple for the local community. Harbin is also a great place to enjoy the Russian buildings left behind from Russian occupation in the city. One of the best examples is the St. Sophia Cathedral, one of the last Orthodox churches still standing in the city. The Province boasts many beautiful natural landscapes, especially at the Wudalianchi Global Geopark in Heihe. The Geopark is home to 14 volcanoes which have actually been forming the landscape here for thousands of years. The park offers countless walking trails and viewing platforms to explore. From here, head to Jingpo Lake in Mudanjiang, which is the largest alpine barrier lake in China that was actually formed by a volcano 10,000 years ago. Here, you'll find the Diaoshuilou Waterfall, underground lava tunnels, and crater forests to explore. Harbin: The capital of the province and famous for its annual International Snow and Ice Festival which lasts every January 1 through springtime. Daqing: Predminately an oil reserve town but well worth visiting to see the Iron Man Memorial and Park as well as their Time Square. Heihe: A border city with Russia and a popular spot for Russians to visit thanks to the Wudalianchi Volcano and Ancient City of Aigun. Jiamusi: Located on the Sonhua River, it is best known for being home to the popular Wofoshan Skiing Resort. Mudanjiang: A popular city for nature lovers as it is home to the Sandaoguan Forest Park, Mudan Peak Nature Reserve, and People's Park. Qiqihar: An ancient walled city and home to the Zhalong National Nature Reserve. Suifenhe: A border city with Russia that offers great streets for strolling and enjoying the old Russian buildings. 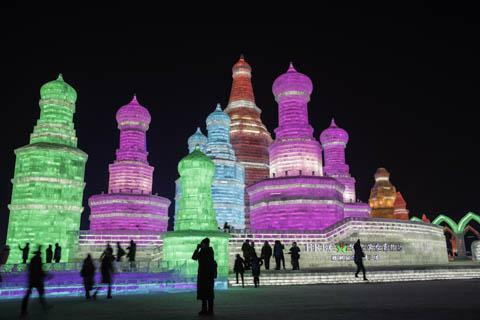 Heilongjiang is possibly most famous for the annual International Snow and Ice Festival that happens every January in Harbin. Here, you'll be able to enjoy incredible ice sculptures, ice and snow villages, and a few parades. After the festival, take a cruise on the Heilongjiang River where you can catch jaw-dropping views of the Northern Lights. If you decide to skip the cold and visit in the summer, check out People's Park in Mudanjiang. This famous park boasts lovely tree lined paths, lakes, and a zoo. It's a wonderful place to stroll around and watch the people dance and sing in the square or see the water lilies bloom in the summer. Heilongjiang food falls under the Manchu cuisine category, meaning hearty dishes to keep you warm in the winter. The province also takes a bit of inspiration from neighboring Russia, especially with their bread and pastries. You'll find street vendors in many of the cities, which make for a great way to try local fare. Although you should use your best judgment when choosing food stalls, as some have been known to heavily spice old meat to cover up its age. In regards to both nightlife and restaurant options, the city of Harbin has the biggest number of options. They offer everything from traditional cuisine to Russian, Mongolian and Korean. Outside of Harbin, you'll find mostly traditional cuisine with more Russian influence as you get closer to the border. Heilongjiang has an international airport in Harbin, along with a bounty of domestic airports that can easily get you to the more remote cities. Buses and trains make it easy to get into the province as well. Taxis are fairly popular in every city and are really the easiest way to get around. Drivers will rarely speak any English so have the address of your destination written in Mandarin and know how to say "please turn on the meter" as many drivers will try to keep the meter off in order to charge you more.